Encouraged by the controversy he had stirred with a series of newspaper articles and inspired by French 'New Wave' filmmakers of the era, Dublin-born Peter Lennon, who had lived and worked in Paris as a journalist for a decade, decided to revisit his native country in 1967 to make a film assessing the state of the nation. Amidst scenes of everyday Irish life -- on the streets, in the classroom, at pubs, sporting events, dance halls, and a lively discussion amongst Trinity College students -- ROCKY ROAD TO DUBLIN blends interviews with writers Sean O'Faolain and Conor Cruise O'Brien, a spokesman for the Gaelic Athletic Association, theater producer Jim Fitzgerald, a member of the censorship board, an editor of The Irish Times, film director John Huston, and a young Catholic priest, Father Michael Cleary. Featuring the inspired photography of legendary French cinematographer Raoul Coutard, and an incisive, literate voice-over commentary by Lennon, ROCKY ROAD TO DUBLIN captures an Ireland on the cusp of enormous social changes but still mired in a regressive, semi-theocratic mentality that would later erupt in repeated church scandals. 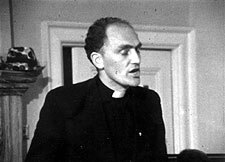 In a striking example of the film's unwitting prescience, one of its most colorful figures-Father Cleary, "Ireland's singing priest"-was later revealed to have fathered two children with his 17-year-old housekeeper. 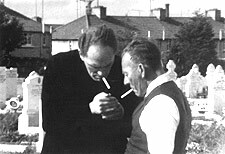 Although the stereotypical image of Ireland as a cultural backwater seems to bear little relation to the country's reputation today, a culturally vibrant and economically vigorous "Celtic Tiger," it is in such moments that ROCKY ROAD TO DUBLIN, as a historical film, illustrates not only how far Ireland has come but also how little it has changed.